If you are looking for the simplest weed candy recipe, you’ve found it here. 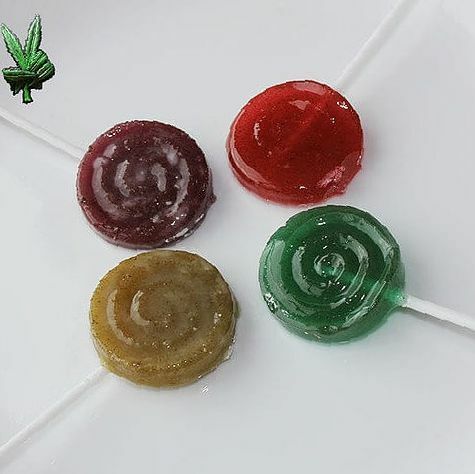 With our marijuana candy recipe, it is easy to make bud edibles like lollipops. Making thc infused candy edibles can be a smart way to get medical pot benefits to children or the elderly. Throughout the world weed candies are used to treat pain and mental disorders. You will first learn the simple secret to any hash edible or cannabis candy recipe, which is tincture. Once you know how to make tincture, recipes for marijuana candies are easy to follow. To choose a strain, consult our strain list here: https://www.ncsm.nl/strain. All of these strains are high quality and powerful, but they are good for different uses. Different strains have different levels of thc. A government strain my have as little as 3% while a designer strain may have as much as 30% thc. It’s important to choose a strain that has the thc level, the flavors, and the medicinal effects that you are seeking. Some fruity flavored strains include the popular Cotton Candy and Fruity Pebbles strain. The Mr. Nice Guy strain has a smooth 13% to 19% thc level, while the powerful OG Kush has up to 30% thc. Using this information, you can choose the appropriate strain for your project. Tincture is a highly concentrated extract of potent cannabinoids and other therapeutic cannabis chemicals. It is generally made by grinding your decarboxylated cannabis and putting it into a solvent like grain alcohol (Everclear). The solvent dissolves all of the terpenoids and cannabinoids, then you strain out the plant material. What is left is a concentrated, liquid weed. A simple way to do this is to use The Magical Butter machine, a simple to use appliance that does the extraction for you. Decarboxylate: Heat your weed at 255 F for 30 mins to activate the cannabinoids. Put your weed into a jar containing the alcohol solvent Everclear. It will stay here until it reaches the desired potency. This can take 2 to 4 weeks. Strain out the plant material with cheesecloth and keep your concentrated weed liquid. You can also evaporate out some of the alcohol to make it more potent according to your own preferences. Making tincture can take up to a month the traditional way, but with time comes technology. And for weed enthusiasts, that technology that was sorely needed was The Magical Butter Machine. Just put your Everclear into the machine, put your weed in, push 4 hour tincture, and away you go. It will grind, decarboxylate, and extract the plant medicines and thc from the weed in just 4 hours. Then pour the mixture through the strainer into a dark-colored light and heat resistant container. The fluid will be hot. But in just those few steps, you have your tincture made. You’re ready to make candies. Remember how much weed you have used, because that will determine the strength of the tincture or of the resultant candies. Now, combine your cup of natural sugar, half cup of corn syrup, and one-fourth cup of clean-filtered water in a sauce pan. Turn heat to medium and dissolve all the sugar by stirring. Once boiling take the temperature with your candy thermometer, till it reaches 300 F.
Take it away from heating source with thermometer still reading. Wait till it cools to 250 F, then stir in your cannabis tincture, and citrus flavoring. If the tincture is alcohol based, be sure it is not exposed to flames or other fire sources. Allow to cool completely, for over 20 minutes and you’re done! Your lollipops will be as strong as the amount of tincture you have used, divided by the number of lollipops. So, be aware of the strength of your tincture (how much weed you used to make it), and, test out your lollipops by having just one, and waiting two hours or more for the effects. This is the easiest recipe for making simple weed chocolate. With this recipe, you can use cannabis ground finely or your cannabis tincture. Here, we are going to finely grind our weed the decarboxylate it by placing it in the oven at 120 degrees for about 30 minutes. While the weed is decarboxylating, we can melt our chocolate using steam. We are going to put the chocolate in the glass or porcelain bowl, then put water in the saucepan and bring it to a boil. Sit the bowl over the boiling water so that it doesn’t touch the water by using a bowl big enough to sit on top of the saucepan so that you can melt the chocolate gently with steam. Now, stir in the cannabis which has been finely ground and decarboxylated. Mix it in well, then pour it into your candy molds, being sure to note how much weed you’ve used, 5 grams, and how many candies you have made. Test the strength eating a small piece and waiting 45 minutes to 2 hours for the effects. Bring your fruit juice, and honey with a pinch of salt to a boil then whisk in the gelatin and stir for up to five minutes so that everything mixes together. Then add your ounce of tincture and stir it in. Next, use a spoon or other tool to transfer the hot liquid into your gummy bear molds. Put your molds into the refrigerator for at least 15 minutes. When your gummies have hardened, just transfer them into an air-tight container of your choice. Test out one gummy by trying one and noting the effects over 45 minutes to two hours. Be smart to avoid overdosing. If you’re not careful, you can overdose on homemade candies and have an awful ride ahead of you. So, you should always be aware of how much weed you have used and how much THC went into it. It’s a good idea to label your tinctures according to THC content. A simple way to do it is to count bowls, how many bowls have gone into making your tincture and subsequent candies. A bowl is about one gram of weed. However, many grams of weed you have used, that’s how many bowls is in your tincture. 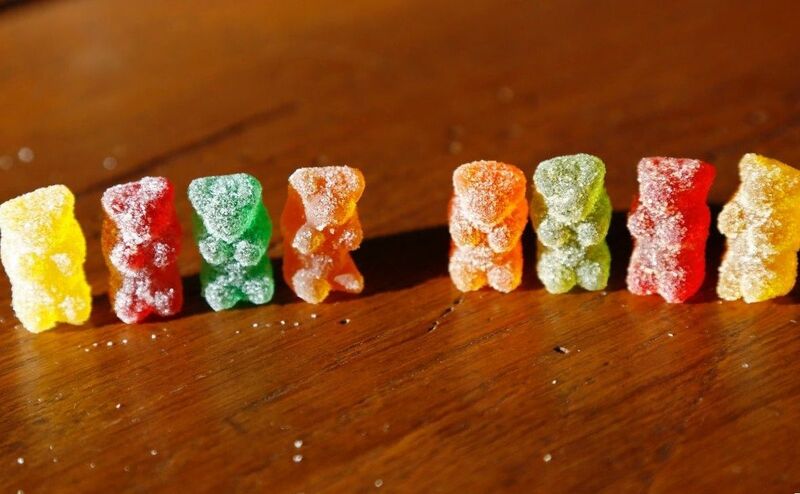 You may have 50 grams of weed in 50 gummies, in which case, each gummi is a bowl. Each bowl would have around 100 mg of thc, so to get about 10 mg of thc per gummi, you would want to spread that over as much as 500 gummies. So, however many bowls you are accustomed to smoking, that’s also how many gummies you can tolerate. It is important to do your own research and calculations for your particular candies and tincture or oil. The main thing to remember is how much weed did you use overall, and then how many candies did you divide that into, and that will always give you an idea of the strength of the candies. You should also always test your edibles to determine the strength. Eat just a small piece and note the taste and potency by waiting 45 minutes to 2 hours. If at 45 minutes, the buzz is strong, do not dose again. Just ride it out until the euphoria and high come down completely and see how long that takes. Then you will know how strong each gummy is, and how long you should wait before redosing. You will also know how many to take for different activities for example for pain relief and preparing for sleep. You should also note the characteristics of the strain you have chosen so that you can use this knowledge in the future to make gummies and other edibles. Edibles dissolve in the stomach at different rates, releasing their cannabinoids at different frequencies, and this fact will determine what strain and type of edible you will want to use for different activities. You don’t say how much tincture you used in the candy recipe. How much? Yes please clarify this issue as you clarify the butter! The only issue with the chemistry of the hard candy recipe, is that when you add the alcohol tincture to the candy base at 250 degrees, the tincture changes the composition of the candy, and the candy will not set up correctly and turns out gooey. I will attempt to boil out more of the alcohol from the tincture next time in hopes that it will not have this effect, but any other advice in regards to this issue would be fantastic. I have a magic butter machine. Will this cook out enough of the alcohol in the tincture so the hard candies will set? What is the ratio of decarboxylate weed to Everclear? How many lollipops does this recipe generally yield? I make oil infused pot. it slow simmers in crock pot 12 hours. I use to make all types of edible snacks for my self. Lately I’ve been into gummy candy. I’ve made a dozen batches or so and lately I find that once I remove from silicon molds, the oil has settled to the bottom of each candy. What can I add or do to keep this from happening. Could you text me your crock pot recepie? Thank you! Can vodka be used instead of everclear? No I can not as the proof is not high enough. Why would you waste weed giving them to kids? Right, and because medical Marijuana we Also give kids Alcohol! That makes perfect sense. But, I am sure you drink, and take alcoholic beverages to places to celebrates when there are kids there. Hmmmm, think about that for a moment would you? Do you have wine or beer in front of them? Any reason my gummies would “sweat” inside the airtight box? I put it in the refrigerator, so would that cause them to do that? If you put them in the fridge when they are warm at all that can happen. Sometimes even if they aren’t warm they’ll do it a bit. Put a shot glass with rice in it in the box if you have to put them in the fridge. You can also toss them in a bowl with some finely ground sugar that will absorb some of the moisture from the candy. Hope this helps. I have a question how many gummi bears does the recipe yeild? I only want to ask because i want to make alot for a party i am having and need to order supplies. If you OD, you can have a CBD dominant strain or CBD only to bring you down, as CBD has anti-psychotic effects. If you get too high eat citrus!